2014 – A Year to Remember! The year started out as the coldest, toughest winter in the past 25 years here in Ontario, thanks to what our weather forecasters called a Nor-easter. When spring finally arrived things certainly began to change here big time. 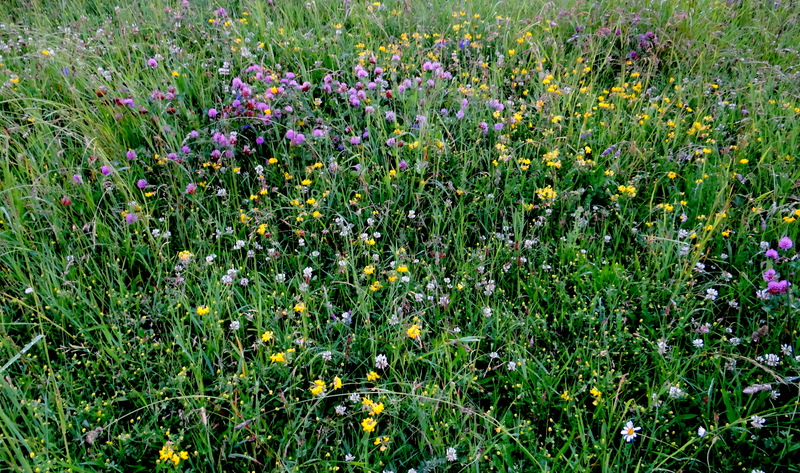 Late May brought us cool weather and abundance of rain fall and in turn unlimited pasture. 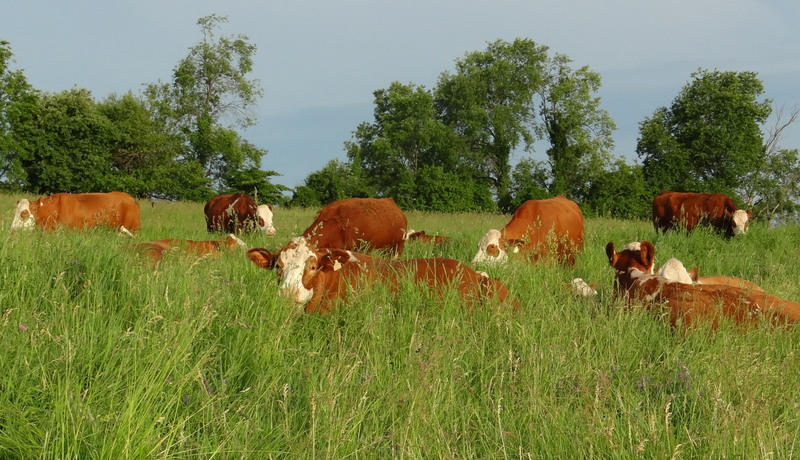 Our Fleckvieh’s never had it so good with knee deep pastures through the summer and fall. It was mid November when our cow herd came back to the barn looking for their winter stored hay. Bull sales went extremely well with herd sire prospects going both sides of the border with 2 of our youngsters going into stud in the US. 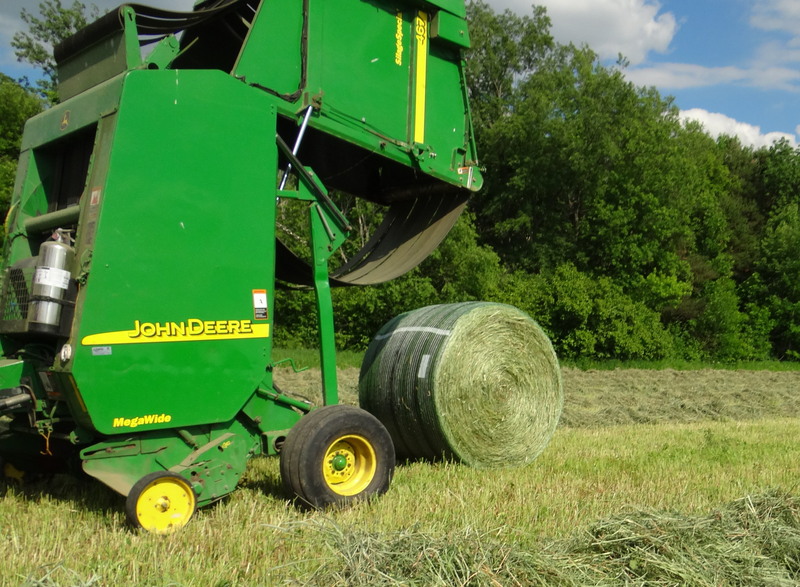 Come summer we upgraded our 430 JD round baler to a 467 John Deere round baler and had it fitted to handle JD B-wrap – a water proof bale wrap, new to Canada for 2014. ” Simply put”, we now can store our hay bales outside with virtually no water or weather damage. We are now feeding this product. It looks and smells the same as the day it was baled. The most important part is our Fleckvieh’s just seem to love it. 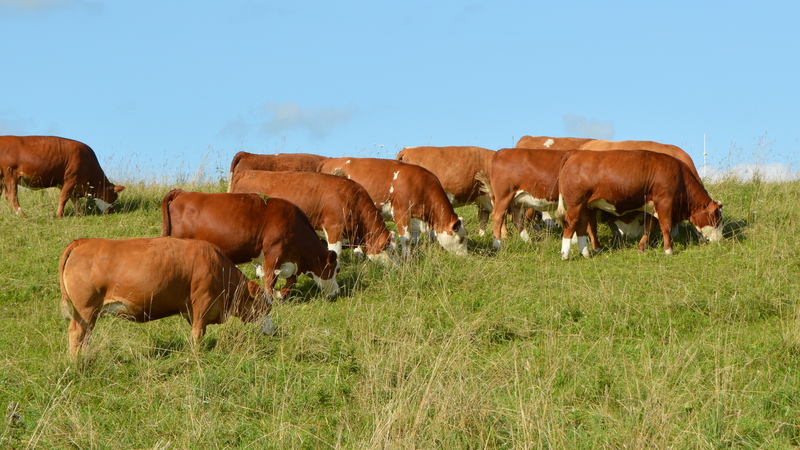 Following a successful haying season, it was time to start preparing a group of sale heifers for our annual Fleckvieh Forum sale. Betty and I had discussed several times over the past few years the pros and cons of instead of taking them to the Auction facility, just placing them on our web site and offering them for sale here at Dora Lee. We were thinking, even if we sold 2 or 3 it would be a good start. We were pleasantly surprised. Our phone started to ring and emails began arriving daily. To make a long story short, we were completely sold out within just a few short weeks. We sold some of our heifers to the veteran cattleman, but what got us really excited was the interest from the next generation. High school students were here buying heifers, starting their own herds and planning to use sales down the road to help pay their way through university. With most of 2014 in the rear view mirror and the wonderful season of Christmas upon us, it is now time for Betty and Ross to count our many blessings. We do have our health and family and really, what more could any man in his right mind ask for. We are really looking forward to having two of our sons, David and Ben with his wife Sarah, along with 4 wonderful grandchildren here for a couple of days over Christmas . 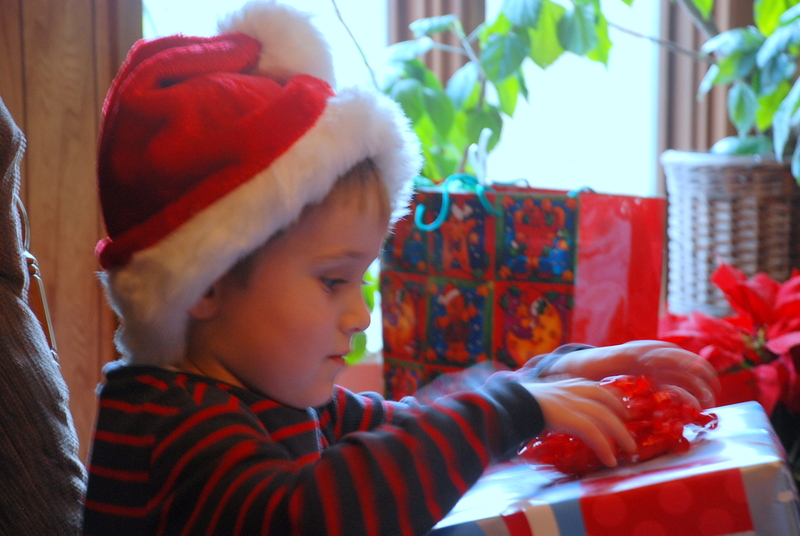 May the Joy of the Christmas season fill your home with Happiness. Wishing each and everyone of you, a “Merry Christmas”. 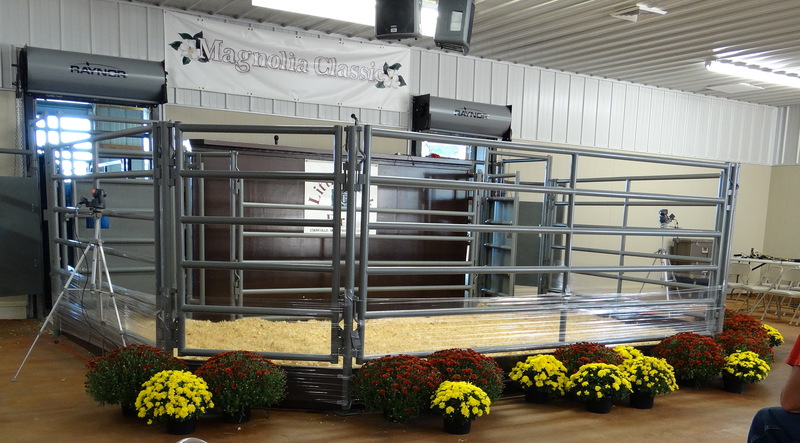 This October, our never ending 364 days a year search for outcross polled genetics brought us to the Magnolia Classic sale, Starkville, Mississippi. Traveling in and out of 3 airports, a four hour drive in a rented car, certainly had me wondering, just why am I doing this? We arrivied at the Magnolia sales facility, where Betty and I were certainly made welcome by hosts Dr. and Mrs Davis and several of the consigners. Just seeing the impressive set of cattle on display -“WOW”. It sure did not take long for me to forget the day and a half travelling it took to getting there. It all started with a phone call from Maurice Webb, a long time breeder of Fleckvieh genetics down south in Arkansas. I had met Maurice several years ago while attending a Dollar Diamond Fleckvieh sale. Several times a year Maurice and I, “simply put” talk Fleckvieh genetics. 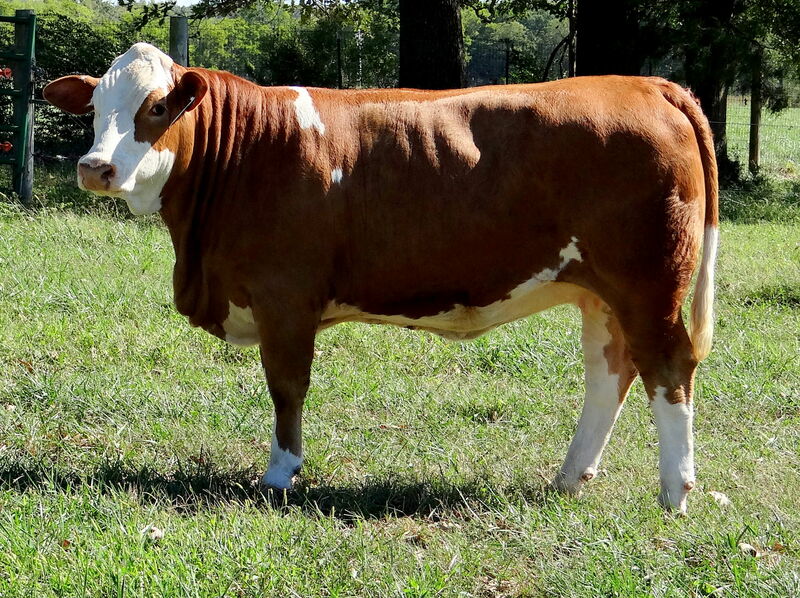 Maurice had been talking to me about Willow Oaks Alda, a polled heifer he was consigning to the Magnolia Classic sale. The top side of her pedigree had outcross genetics for us, by time proven greats, Hafke, GPCC Heather, and Hackenberg and her polled genetics going back to South Africa. My first response was “send me a hair sample”. I needed a genomic profile on Alda to give us an additional selection tool to see if she had what it takes to make a difference here at Dora Lee. Her genomic profile really got this old cowboy excited. Her RFI score (feed efficiency) was, shall I say, over the top. On scale of 1 to 10 with 1 being the very best and 10 not very good, Alda scored a 1 placing her among the very elite for feed efficiency for beef cattle here in North America. The next order of business was to find a way to get to the Magnolia Classic sale and see for ourselves if she fit into our selection criteria to come to Dora Lee. The next step was to attempt to out bid a sale ring packed with Fleckvieh Breeders from south of the border. We were successful and she arrived here at her new home on Dec 4. I am excited about the potential this young lady has to offer. However, Alda like any other additions here, will need to prove to us over and over again she has what it takes to once again raise the bar here at Dora Lee.